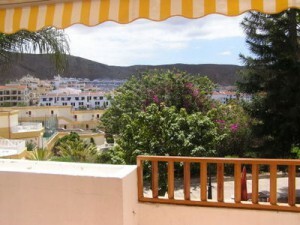 One bedroom apartment on the Cristian Sur complex in Los Cristianos Tenerife. Available for holiday rental, this is one of our Cristian Sur apartments in Los Cristianos. It is situated on the Amarillo block and is on the 1st floor. Please note there are no lifts on the Cristian Sur complex. The complex itself has 2 shared pools and a separate childrens’ pool. There is also a laundrette on site, as well as a restaurant, snack bar and shops. A British doctor is available if required and there is even a place to hire cars. The complex has a 24 hour reception. The apartment has satellite TV and a DVD player, with 2 single beds in the bedroom. There are many boat excursions available at Los Cristianos Harbour. We would like to recommend in particular a trip on the Jolly Roger. This pirate ship is a replica of an 18th century galleon. The trip consists of sailing out to sea to watch the whales and dolphins, followed by sailing up the coast to La Caleta Bay, where the ship drops anchor. Guests are then allowed to go for a swim, followed by lunch. 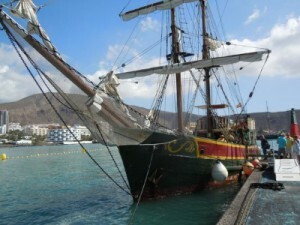 Afterwards the ship sails back along the coast to Los Cristianos. The views are amazing and the crew very humourous and entertaining. The ship can carry a total of 80 passengers, some on the top deck and some below. There is also a bar and toilets onboard. This entry was posted in Tenerife Apartments and tagged #cristiansurtenerife, #holidays4uorg, #karendurant by holidays4u. Bookmark the permalink.